World Anvil Summer Camp 2018 has Launched! Introducing our second biggest event of the year, #WASummerCamp is a completion based 30 day challenge for the whole month of July! 30 prompts • 30 days • 300 words each! There are some super-shiny badges to achieve and over $750+ worth of prizes to be won! If you’re super eager to get worldbuilding, click the image to get started, or head on over to the Challenge Page! But first, lets talk about how this challenge works! This is a completion based event in which we challenge YOU to complete 30 worldbuilding prompts within 30 days! You can choose how you want to take part and complete the duels in any order you like! Pace yourself by completing one duel per day, or do as many as you like in one go! It doesn’t matter if you miss a day, but the challenge deadline is final. Each prompt requires a minimum of 300 words before you can check it off of the list! All through July we will be sharing super inspiring posts on Twitter, Facebook and Tumblr to help motivate you during this challenge! Protip: Make sure you’re subscribed and have your notifications turned on so you don’t miss out! Not only will Janet be sharing videos talking about the prompt in more detail, Gorge will be doing daily livestreams on Twitch and walking you through his progress with the challenge as well as sharing some tips & tricks and inspiring articles! You can also join us on Discord for worldbuilding conversations and generating great ideas! There will be three tiers of completion rewards in this challenge! If you complete 10 prompts you will recieve a shiny copper badge upon your World Anvil profile! But why stop there? Push yourself a bit further because the silver badge is super shiny and will be awarded to those of you who complete 20 prompts! This ridiculously shiny gold badge will be awarded to every person who completed all 30 prompts ! But wait, there’s more! If you complete all 30 prompts you will be entered into the GOLD PRIZE RAFFLE!! There’s a veritable treasure trove of prizes to be won! Multiple DUNGEONFOG Memberships and one very special Membership for LIFE. Holy Moley, that’s a lot of prizes !!! 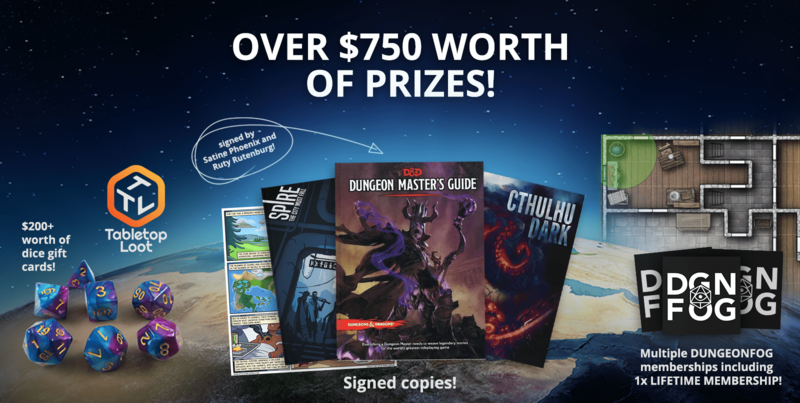 Thanks to our awesome sponsors, DUNGEONFOG.com and Tabletop Loot, we’ve got some EPIC PRIZES to be won! A tool for game masters and worldbuilders that generates stories based on maps drawn with online editor. Create, share, play, and export maps with GM notes! You want dice? They’ve got dice! So many colours it’s like being at a sweet shop AND they have glow in the dark ones too! GRAB YOUR HAMMER, AND GO WORLDBUILD!